There aren’t many more sensitive subjects than discussing infertility strains. If you are or have ever been faced with infertility struggles, you are definitely not alone, but you may feel so isolated in dealing with what can seem like a taboo topic. The goal of infertility treatments is always the same: to get pregnant. But we rarely talk about the path it takes to get there and what to do when that road seems like a dead end. Our dialogues about infertility must be more open and honest about the struggles we face and even the successes experienced, but also the failed attempts and continuous questions. When lines of communication are open, and we see people’s stories instead of their statistics, we can better support and show compassion to those in the middle of their journey. One of the most difficult conversations to have centers around knowing when you should cease to pursue the next fertility treatment. What if your end goal has not been met, and a hard decision must be made? How can you know when the last time should be? The easy answer is that it will be different for everyone. Everyone’s story is different, therefore, how they get there and how many times it takes them will be different. Someone may try IVF one time and be able to get pregnant. Others have done the procedure four or five times and finally experience what they’ve been trying so hard for. Some may endure fertility treatments for years and have no luck. There are some things to contemplate when making the final decision to stop fertility treatments, and considering the thoughts below will open up this discussion. 1. What is your and your partner’s emotional diagnosis? Discussing your feelings can allow you to be your own doctor of your emotional state throughout the infertility journey. Many emotions will change, and you may experience a continual roller coaster of highs and lows. Have an honest talk about your current feelings and what you are prepared to handle in the future. Are the infertility treatments causing more stress in other areas of your life or on your relationships? Do you remember the last time you did something for fun that didn’t involve your infertility? Are you experiencing signs of onset depression because of the emotional affect this is having on your life’s outlook? If the answer to any of these questions is “yes,” it may be time to start considering your alternative options. 2. What kind of timeline do you have? Was there a period of time that you and your partner agreed upon when you first started infertility treatments, and has that amount of time come and gone? Does your age play any role in your decision to continue or stop treatments? Consider the probability of successful interventions at certain ages and with any other factors you may have run into that could change the effectiveness of a treatment. Combine the two subjects that people really don’t want to talk about, and here you go: money and infertility. Did you have a max amount of money you were willing to spend when you began treatments? Are the treatments starting to put an added strain on your current finances? Money may not be the first reason to stop pursuing this hope because of the opportunity to receive grants and scholarships to provide some financial assistance. However, after the grants run out and you’re dipping into your 401k or stretching your budget and overusing the credit card, consider how financially able you are to continue with another treatment. Coming to your final decision to continue or stop fertility treatments after all things have been considered will no doubt be one of the most difficult you will make. 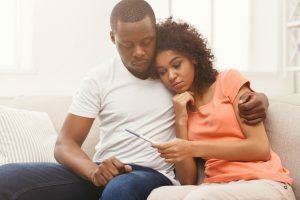 If you and your partner have decided that it is the right time along your journey to cease further fertility treatments, it may feel as though you are experiencing a death in your family. As with any loss, there are stages of grief that we must confront as we make our way to the other side of the haze. Accepting a new idea of normal for your family or your future will take some time. But searching for the light at the end of a long tunnel should be where we focus our efforts. Is adoption the route you choose in order to bring a child into your family? You can concentrate on researching your options in adoption and the details it involves. Maybe you feel you could find purpose and give purpose in fostering. Contact your local foster care system and find out what it requires. Your family’s decision may be to forego all your family-building options and start living life again without the confines of fertility drugs or the high cost of medical procedures, surrogacy or adoption. Whatever your choice, consider what is best for your health and happiness because your story looks very different from anyone else’s.